This league is a series of games launched by CoW Support. Every month start a new game, four months lasts one season. The common thread in the league is the ban on the use of gold. This ban is monitored by the support and punished by the game play. These rules are needed to get a regulated and friendly interaction with the other players. Because the struggles in the league are often very bitter and led with great severity. As you play in the league, you should be aware that you are playing with players who will seek out and exploit every void in your strategy. A lack of agreement among neighbors and others in the same team, is quickly exploited. The lack of support for a threatened team partner who asks for help is fatal and often leads to their own demise. The players should play fair, the newspaper is subject to certain restrictions. Registration until all 60 seats have been taken or until 28.2. 18:00 UTC. A conversation will be created in the forum announcing the game ID and password. Players gradually enter the map and are randomly distributed to the nations. Game start, the second game of the series starts on first of March at 18:00 UTC. Registered players who do not appear on the map within the first 24 hours after the start of the game will be replaced by reserve players! The post was edited 1 time, last by Xarus ( Feb 27th 2019, 9:47am ). 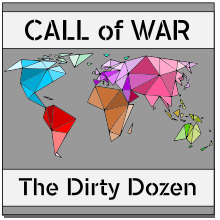 I have changed the sign-up for the Dirty Dozen, last month we had some problems with the colors of the teams and the number of alliance players the teams. All four players of a CoW-Alliance must be in one Squad, other player of their Alliance are not allowed to player in the Dirty Dozen in the same Round! We have 15 Squads, this Squads will be build 5 teams for the the next round. Info: The conversation with the game-ID and the password will be set up on 02/25/2019. I will only add new players to this conversation after checking his profile. To guarantee that we have not more than 4 players in the game from the same CoW-Alliance. Sign-Up is closed for the March game! - feel free to leave a reply if you what to be a reserve player or to get info when we open the sign-up for the next game. The post was edited 8 times, last by Xarus ( Mar 1st 2019, 9:20am ). If you have problems or questions, please leave a reply here! No idea what squad to sign up for? Tell your three friends (Ally comrades) witch one you have chosen. Any idea what map we are on? We play all rounds on the 100 payer world map. No anonymous games would be nice. I would really appreciate this. I like to see the players name while I am playing the map. Has round 2 started?and is this open to all? This is the second season. Yes, this is open to all just sign up for a team! this is the first season but it is the second game. Maybe it will help if you ask for the players name before you accept a NAP in the next round! A player that would break a NAP would also lie about the UserID. What do you think of distributing the five dozen on different continents? Africa and Asia (east of Ural). And Australia is neutral. Way too slow early game. sry for the inconvenience, but may you fix this? @alexl12: I can't do it - you need to choose a other team. I changed the the options at the poll, now you can choose a other team. But I must close this option again in 36 hours - This will be the time I open the conversation. @12pit: If used this idea for the "Clash of Alliances" some years ago, you can search for it. Don't know "Clash of Alliances". I've only been in the Alliance for about half a year.